— Always ask for permission before entering private property or taking a picture of people. Please note that 99% of Yap is privately owned. — Sit properly. For women, don’t squat in public. It’s improper and disrespectful. — Learn how to say “Sirow” and “Kammagar” meaning “Excuse me” and “Thank you” respectively. — Walk around in public in transparent or skimpy attire. 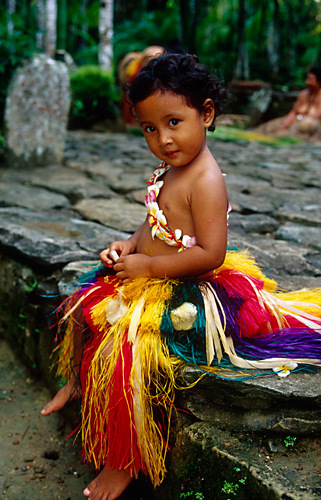 Yapese culture requires women to cover their thighs. Women can wear clothing with hemlines reaching to just above the knees. — Step or walk over people or their baskets when they are sitting down. It’s disrespectful. — Walk around villages empty handed. It shows you’re visiting an area without a purpose and therefore are likely to cause trouble. A small branch (Muteelpaaq) would do if you don’t have a handbag. — Walk around at night without carrying a light, especially in the village. It means you are looking to cause trouble. discovered paradise? You should go to KOSRAE. If you do, you’ll probably see very few Westerners, though if you stay at the highly recommended Kosrae Village and Ecolodge you may run into a Lonely Planet reviewer (who, by the way, loves the place)…and so will you. find the ancient city of Nan Madol, a stone city built nearly a thousand ago on almost 100 artificial islets–platforms built from stone and coral–criscrossed by canals, and therefore sometimes called, “Venice of the Pacific.” Nan Madol was a site built as a home for elites and also their site for, as Wikipedia’s entry on Nan Madol describes them, “mortuary activities.” No one has been able to explain where the stones werequarried and how they got to Nan Madol.